Texas Mayor has something to say to Muslims that they are not going to like. It is clear that America is facing a very real threat from radical Muslims immigrating to our country. Thanks to Obama’s disastrous policies, many dangerous Muslims have been able to infiltrate various states and impose their will on helpless citizens who fear repercussions for challenging their way of life. It was clear since Obama took office that he had an agenda to bring in as many Muslims as possible and call out anyone who questioned his actions. Over his 8 years, our country slowly lost the ability to question our President’s decisions, and those who did suffer the wrath of angry liberals everywhere. Most Americans simply fell in line and shut their mouths in fear of losing everything. It’s pretty obvious that many Muslims wish to transform our Government to suit their religion and impose Sharia law on American soil. Sharia Law cannot be allowed to take hold in our country because it stands against every American principle. Muslim principles violate our most fundamental freedoms and liberties and are a rival government system. Thankfully, many states have pushed back against this ideology and for the time being, we appear to be in the clear. However, if we are not careful, things could change at any moment. In Texas, mosques were defying state and federal law by operating on their own “court system” but thankfully, someone stepped in to stop this madness. 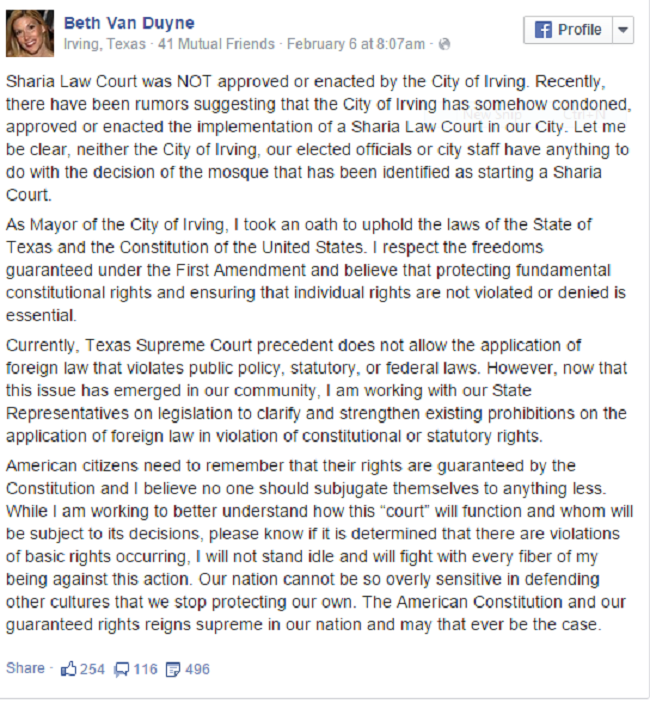 This radical group of Muslims is not pleased with the Mayor of Irving, Texas after she put the end to America’s first “Sharia Court.” Mayor Beth Van Duyne has accused mosque leaders of creating separate laws for Muslims, which is why the city voted to stop these supposedly “voluntary” tribunals from operating. All four of the “voluntary” court’s lawyers were unlicensed in the state of Texas, a third-degree felony. Mayor Beth Van Duyne received several phone calls on the matter. It seems that the Islamic Tribunal not only was unlicensed, but they failed to notify the city of their illegal court being operated in city limits. She promised to get to the bottom of it, and she did. Before the historic and controversial vote, here is how Mayor Duyne responded on Facebook. Sharia law treats women as second-class citizens. It also punishes non-Muslims, including Christians and Jews and calls for the death penalty for homosexuals. It obviously has no place in American society, officially or unofficially. Yet, this group of Muslims was conducting their own Sharia courts in defiance of our society. Their website clearly stated they followed Sharia law over American law. It is not a matter of Freedom of Religion, it is, in fact, treasonous to think that we will operate under such evil rules. These Muslims are living on American soil and need to obey our laws just like everyone else. There are no special privileges for anyone, and they should not expect to be exempt from following the rules. Muslim groups like CAIR and The Muslim Brotherhood are working tirelessly to impose Sharia Law on our land. Their end goal is to fundamentally change our country and rule all Americans under the same laws that they operate in many countries in the Middle-East. Other government officials need to take a cue from the Mayor of Irving, Texas and fight back against Muslims who are trying to transform us. Sharia Law treats women and homosexuals as second-class citizens. The Republicans are not the threat. Radical Islam is the true threat, and if we don’t get our heads out of our asses we may wake up one day and be unable to recognize our country.